October is swiftly approaching and my 2007 NaNoWriMo novel idea still lacks most of its plot. What am I to do? 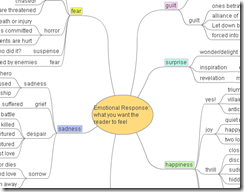 I decided to use Freemind in a brainstorming exercise and I thought about memorable novels and the key points in those stories with the highest emotional resonance. This decomposition to the basic plot that led to the strong emotion is one tool I am using to plan how to achieve similar emotional highs/lows in the reader of my novel. What do you think? How are you preparing for November? P.S. I’m using the free Microsoft Windows Live Writer to create this post. Thus far it has proven to be a remarkably intuitive tool.